Pathfinder: Kingmaker is set to release next week for PC - the first CRPG within the Pathfinder tabletop lore. We had a chance to ask a few questions with Narrative Designer Chris Avellone - known for his work on several Black Isle Studios and Obsidian Entertainment RPGs such as Icewind Dale and Pillars of Eternity. Here he discusses the game's storyline, writing, and characters. Check out the interview with Chris below, and be sure to hit up our hands-on impressions of the game from PAX West last month. RPG Site: What sets Pathfinder: Kingmaker apart from other CRPG storylines? 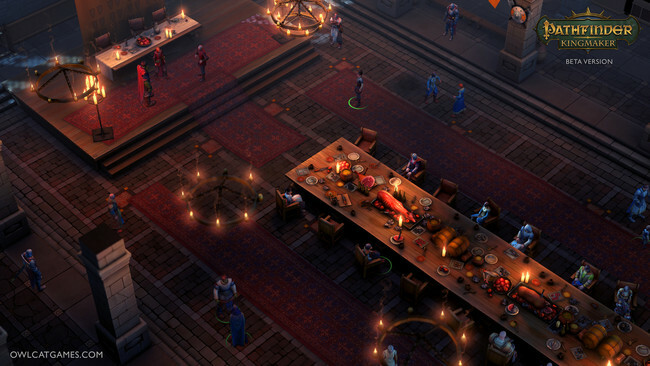 Chris Avellone: The setting, the companions, and the challenges you face set it apart - in Pathfinder: Kingmaker, it’s not about squaring off against an evil antagonist. It’s more nuanced than that, and presents the player with a lot of hard choices in being a leader and ruling a kingdom. And sometimes that means choosing the common good (or greater evil) over your own interests - or those of your companions and allies. Still, I think those choices are what make for the best stories. RPG Site: What is your favorite aspect of Pathfinder: Kingmaker's writing? CA: It’s just plain fun. The goblins in Kingmaker, for example, are an unusual take on the tried-and-true goblin trope, so being able to play around with that in companion writing (I wrote the goblin companion, Nok-Nok) was a blast. I haven’t had the chance to do so much comedy (mixed in with some more serious themes) since Fallout New Vegas: Old World Blues. Also, Pathfinder as a franchise is very player-centric for a role-playing setting. It allows for a great deal of open-world exploration and allows the players to adventure at their own pace and literally create their own adventures - really, it’s encouraged. Sometimes RPGs can get bogged down on mandating a storyline or forcing a linear path, but Kingmaker bucks that trend, and I think that makes for a better RPG since it lets the player participate in the story more. RPG Site: What other writing projects of yours would you compare Pathfinder: Kingmaker to? CA: I’m not sure there’s a strict comparison, but it very much has the feel of the old Black Isle Studios isometric games we did with BioWare’s Infinity Engine. It has far more story than Icewind Dale, and more combat and system options than Planescape: Torment, however, so even the comparisons aren’t one-to-one. RPG Site: Is Pathfinder: Kingmaker more about the world it takes place in or the characters within it? CA: It’s about three things (at least) - one is your character’s journey and what decisions you make in creating a kingdom of your own … even if you abstain from ruling it. Secondly, there is a story playing out in the world that brings you in direct conflict with ancient forces at work - the intersection and unraveling of this plot is key to the adventure. Lastly, the game is also very much about your companions, and their presence adds an additional narrative layer to the game - they are woven into the plot, so they aren’t there simply as window dressing, they help move the story forward. Those are only three things, however - the game is about much more than that, and it allows the player to explore other nations and cultures of Golarion (even ones outside the Stolen Lands - you’ll see these cultures play out with people you meet in the adventure who come to your kingdom as diplomats, travelers, merchants, and more). RPG Site: Do I have to be familiar with Pathfinder lore to get the most out of Pathfinder: Kingmaker? CA: No, that would be a difficult task - what I like about Pathfinder’s world is that it’s easy to get into, but as you explore it, there’s a lot of discoverable depth to it (there’s countless modules and sourcebooks related to the world of Golarion, the surrounding planes, and the adventures that take place within it). The game’s taken the same approach - it’s easy to get into, but as you explore the Stolen Lands, you’ll find an equal amount of depth in the allies, antagonists, and towns and nations you interact with. RPG Site: Is choice (branching narrative paths) a factor in Pathfinder: Kingmaker's writing, or is the narrative given mostly a static one all players will experience? CA: Definitely branching in multiple ways - through narrative choices, kingdom choices that impact the narrative, and alignment-based choices across the game. Kingmaker’s Creative Director (Alexander Mishulin) and the Lead Writer (Alexander Komzolov) worked very hard in introducing reactivity and branching quests from the start of the game to the finish, and it was great to be able to work with them on developing those quests. Pathfinder: Kingmaker is set to release on September 25.